“Hello beloved friends. This is Sophia. 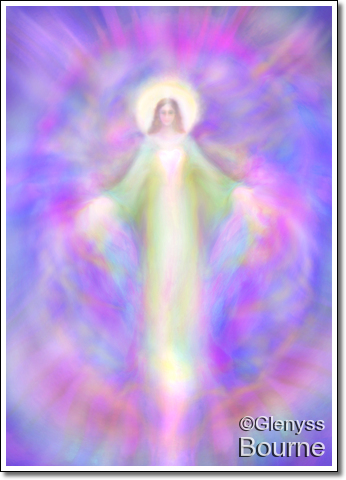 “This site was created at the request of Archangel Metatron, who I have been channeling for a while. He asked for a website to be created where Archangels may speak directly with all who are attracted to this space. His goal is to create a direct vehicle of communication for the Archangels with people currently living on the earth. They are interested in sharing information and guidance with humanity as we undergo dramatic changes occurring with the new levels of energy affecting us all, including planet earth. Currently, there will not be an opportunity for private sessions. 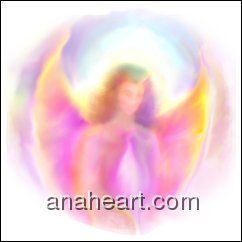 Archangel Mebahel is the Angel of Truth, Honour, and Justice who protects the innocent! Call upon Archangel Mehebel when you wish to find that which has been lost, and need protection against those who would do you harm. Archangel Mehabel nurtures and protects empathetic beings who wish to help others, and helps them to nurture and protect their own energy. You are Eternal! There is no death, you merely step out of this body and begin another great adventure in different form. You come home to Yourself. You are loved beyond measure, do not fear for I am ever with you. Love lives forever, it is never lost. 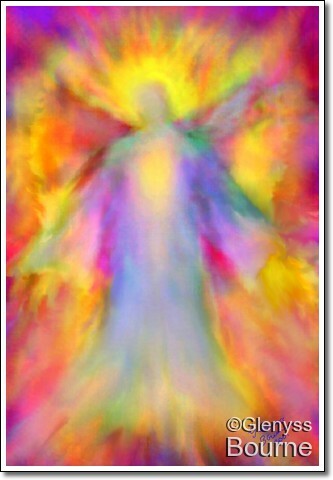 I am Archangel Ambriel, I offer you Clarity, I will help you to look into Infinity and find your own Truth. You transcend matter, you are Spirit! Focus on the highest and it will come to you. You are much more than you know. I bring you Infinite Love and Blessings from on High. We must remember that we are multi dimensional powerful beings of Light, we are Powerful Eternal Spirits who need fear NOTHING! In these troubled times it is easy to give into fear, and in this fearful state our LIGHT begins to dim. As a powerful aware Being of LIGHT you must remember Who you really are and let your LIGHT shine brightly to enlighten these dark days and to lift the earthly vibration! If enough of us boldly shine our LIGHT on the world, it will become Heaven on Earth! The Angels are with you! 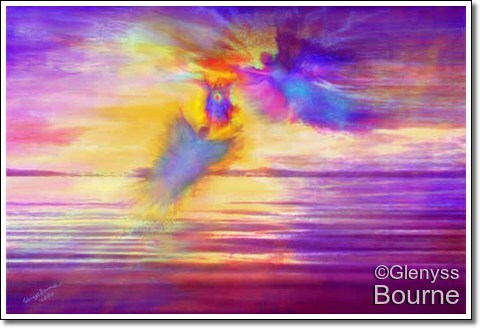 The Angel reading comes from the book Sacred Wisdom by Glenyss Bourne, a book of Angelic Guidance. Signed Fine Art Prints from the digital original of this painting are available here.